This World Fair Trade Day (May 13, 2017), we honor the hard work small-scale farmers do to tend the land. Small-scale organic farming and regenerative agricultural practices combat our climate crisis and help feed the world. Here are some stories showing just a few of the ways that fair trade producers and their brand partners are collaborating to grow ethical supply chains through regenerative organic agricultural methods, so they can produce products that we can all feel good about. This tree-planting project is part of a larger vision of growing sustainable communities. 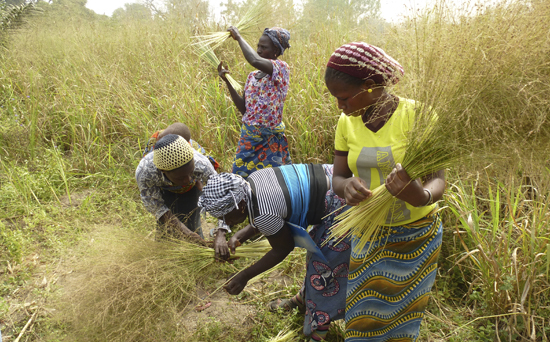 Alaffia’s programs also include community-based trainings for rural farmers on the benefits of intercropping shade-adapted crops with shea trees, and on the impacts of reducing the cutting of shea trees for fuelwood or agricultural clearing. Instead, their Alternative Fuels Project offers resources for sustainable fuel alternatives, such as bio-gas and bio-oil, to reduce the demand for wood and charcoal. Declining biodiversity, soil fertility and soil productivity are problems that the farmers of UNOCACE cooperative in Ecuador know all too well. That is why Alter Eco has brought together supply chain partners to fund a dynamic new agroforestry project that addresses these challenges from many angles. In the first year alone, cacao farmers have rehabilitated nearly 200 acres of land, planting a diverse mix of cacao plants and trees for fruit and timber production, a total of 63,500 plants in all. By promoting the sustainable cultivation of traditional “Cacao Nacional de Aroma Fino” beans, an heirloom strain known for its quality, farmers have been able to increase their incomes. There is a human side to the revitalization of those landscapes, too. 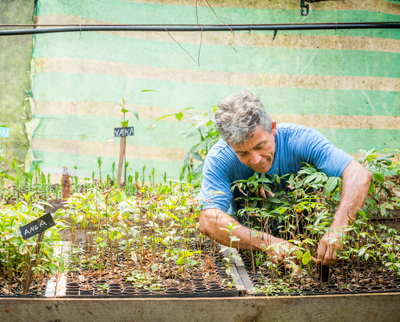 Farmer-to-farmer trainings in agroforestry practices are engaging the next generation of farmers in the future of sustainable cacao and creating opportunities in their communities. 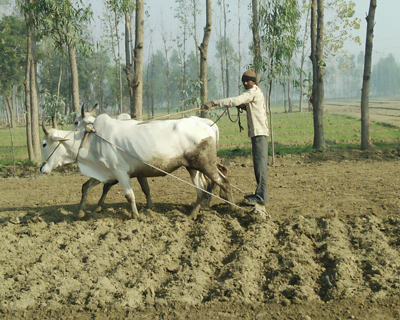 Farmers in the Indian state of Uttar Pradesh face many challenges to produce food and cash crops from increasingly degraded land hammered by climate change and low commodity prices. That is why Dr. Bronner’s is partnering with farmers and the local group Creation Biotech to build the world’s first organic and fair trade mint oil project. Funded by Dr. Bronner’s, the project’s fair trade fund and a donor grant, these farmers will soon implement a comprehensive regenerative agriculture program. While farmers already produce small-scale vermicompost, the next step is to develop a centralized composting facility, giving soils a boost while sequestering carbon. They are also planting cover crops to protect the soil from erosion, and they are planting trees for wind breaks as well as fruit and nut production to feed the community. Rounding out this regenerative approach, farmers will add nitrogen-fixing legumes like lentils, peas and beans to their intensive crop rotation schedule, some of which will be sold to partners in Germany at premium organic and fair trade prices. Collaborations like these show how all parties in the supply chain can come together, building resilient communities, healthy soils and good food as they bring together fair trade and regenerative agriculture. Changing weather patterns and coffee leaf rust have been decimating yields for coffee farmers around the world. Yet the farmers of COMSA cooperative in Honduras have been getting to the root of the problem — literally — by investing in deep organic growing practices. They sum up their innovative approach to organic and biodynamic farming as “The 5Ms,” including organic Material, Microorganisms, Minerals, living Molecules and grey Matter. The first four “Ms” are key to developing rich compost and organic fertilizers, the building blocks of healthy, living soils. The last “M,” grey Matter, represents what each farmer brings to the equation: their imaginative, creative problem-solving abilities that can take all of the above and transform them into a resilient, biodiverse farm. Farmer-to-farmer trainings are a proven method to spread best practices, and that is why Equal Exchange has brought COMSA together with other coffee cooperatives in their supply chain. Collaborative, farmer-led learning exchanges help foster the most important “M” in COMSA’s recipe for organic farming, the grey Matter — instead of just recipes, they are able to share a mindset for growing a new generation of inspired, creative farmers who can work in concert with the plots that they tend. And that is truly regenerative agriculture! Members of Farmer Direct Co-op have been stewards of the land for generations, and some of their farms have been in the family for over a century. They grow oats, legumes, beans and oilseeds such as hemp, bringing together traditional cultivation with new research and tools. Some Farmer Direct Co-op members integrate cattle into their farms as well, building nutrient-rich soils and creating additional sustainable revenue streams. Many members have intensive crop rotations planned, cycling each field through multiple species of green manure crops between the cash crops, all with the goal of cultivating rich soils that sequester carbon and support a bounty of crops. Deforestation and land grabbing for cattle farming have severely reduced the sub-tropical rainforests of Paraguay and harmed the Aché Guayaki people who live there. Fighting back against decades of colonial violence and exploitation, the Kuetuvy community is cultivating mate in the understory of their forest reserve. Their goal is to earn a living in harmony with the rainforest instead of depleting it. Guayaki has worked with the indigenous Aché Guayaki people to cultivate their mate and then purchase the harvest. They have also funded a nursery, growing organic mate seedlings to plant in the understory, as well as native hardwood trees for reintroduction to the forest, regenerating the canopy and the sustainable crops underneath it. Guayaki is also furthering their support of farmer-led regenerative agriculture by building a research center on a reserve near Missiones, Argentina. The Center for Life Regeneration will host workshops for local farmer-to-farmer trainings, as well as provide students and scientists from around the world with a site for field experience where they can see local agroecology and education systems in action. Conventional cotton is considered to be the world’s “dirtiest” crop: it takes approximately one-third of a pound of synthetic fertilizer to produce the cotton for one shirt. Add to that the labor abuses throughout the supply chain, and the true cost of our clothing is astonishingly high. But Maggie’s Organics is taking a different approach. Every garment they sell is spun, cut and sewn under fair labor conditions, and all the cotton they buy is also fairly traded and organically grown by small-scale farmers. One of the benefits of organic cotton farming is that it helps build the soil to retain moisture, allowing cotton to thrive in less-than-hospitable conditions. Yet changing weather patterns have been taxing even on these hardy crops, and cotton farmers in Peru have been suffering from a long-term drought which has left fields so dry that what rain does fall runs right off. Extreme times call for extreme measures, and that is why Maggie’s is contributing to farmers’ efforts to purchase emergency water reserves. In an industry where most companies cannot even be sure where their shirt was sewn, collaborations like this help to keep farmers on their land, even against extreme odds.